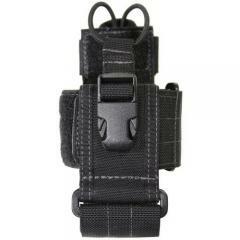 This rugged holster from Maxpedition is designed to hold a large radio, GPS device or satellite phone. It comes with an adjustable top retention strap with a side-release buckle that holds the contents securely in place while still providing space for an antenna. Its diameter can also be adjusted for a secure fit. It can be worn horizontally or vertically on your belt for easy access, or attached to a Maxpedition bag. The holster is made from tough ballistic nylon, with reinforced composite nylon stitching for enhanced wear resistance. It features a triple polyurethane coating and taped internal seams to keep out water. This can hold my iPhone 5s even in an Otterbox case. Well made as far as I can tell.